Oropesa is one of the oldest inhabited sites in Spain. It is said that Hercules founded the town in 1716 BC. under it's previous name of Orospeda. In 1366 the castle and surrounding lands belonging to Don Garcia Alvarez de Toledo who restored it only for it to be virtually demolished 100 years later. Restoration took place in 1402 which is basically the castle of today. A later member of the family was Francisco de Toledo, Count of Oropesa who served as 'Virrey' of Peru after whom the Parador has its name. Over the years the castle has been a refuge for soldiers, monks, nobles and travellers and this use continues as a Parador. From the rooms, or better still from the top of the Homenaje (Homage) Tower, there are exceptional panoramic views of the Vineyards, olive groves and grazing land with the background the often snowcapped Gredos mountain range. Similar views can also be enjoyed while using the hotel swimming pool. Columns and arcades make the courtyard a feature of the Parador with original adornments such as curtains, lamps, and large chests are used as decoration. September is an interesting month to visit Oropesa. The annual festival is held from the 8th for three days and this is followed by the festival of Beato Alonso which takes place on the 18th and 19th of the month. 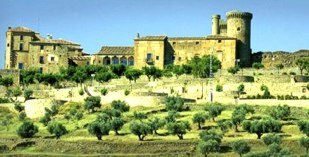 This Parador of Oropesa has thirty twin bedded rooms, fourteen rooms with a double bed and four suites. All the the rooms have a private bathroom and also contain a telephone, satellite television and a mini bar. 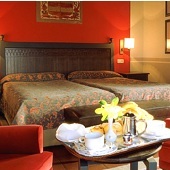 The bedrooms are smaller than is usual in a Parador but are not unduly cramped. They are bright and decorated with woven curtains and bedspreads and have windows looking out over the vineyards of the area. The Parador Oropesa has air conditioning and central heating, currency exchange, lift, parking facilities (without security and limited places), piped music, satellite television, seasonal swimming pool, a restaurant and bar. There are facilities to hold business meetings. Distance from the nearest airport is approximately 165 kms and the nearest train station is 1 km away. We had a fabulous two night stay at Oropesa on the way down to Mijas. The parador and staff were excellent. We had a corner room, and in the morning we had surround sound bird song, with the lesser kestrels nesting in the castle walls. Our evening meal was made up of local dishes, and it was interesting, tasty, and the lady waitress excellent and kind. Breakfast in the morning was on the fabulous terrace, glazed, but with views over the plains and towards the snow capped mountains beyond. We enjoyed our mid day snack on the terrace that overlooks the courtyard (where there use to be bull fighting - not that we like that, but it is interesting to see the old photos of it). There isn't a lot to do in the town itself, though we enjoyed the walk round the main sites and visited the castle. We enjoyed the murals drawn on the walls round the town, obviously by different local groups. The parador has lots of interesting wall plaques describing elements of its history, and the lesser kestrels, which we found very helpful, and we bought the book 'The Lost Corners of Oropesa" (in Spanish) written by a staff member and showing lots of photos and engravings of the old town and its history. Next time we go we will take bikes so we can explore the surrounding countryside, and drive along the back roads to Guadaloupe. Oropesa Parador was really beautiful - we were upgraded to a suit with an octagonal turret bedroom with a four poster bed which was completely unexpected .Fantastic views across the rooftops from all six windows! We had lots of fun exploring the castle and the village and the surrounding area by car .Staff were all very helpful and friendly - very generous gin and tonic pre dinner ! Lunch and dinner were both lovely with local dishes on the dinner menu ( no lunch required but we can never resist trying any tapas) Quiet and easy to park at the Parador.Nice terrace sitting area outside and lots of rooms to choose from inside .We were there at the end of October and the weather was perfect - warm sunny blue sky days and cool at night .We would be very happy to return here. We arrived at the Parador of Oropesa having travelled through the Gredos mountains and as ever had a good welcome. The room as always was most satisfactory. The public areas were very interesting. The food was good and the hotel has an excellent position near to the town. The staff throughout were as usual helpful and happy. This will be another Parador we would visit again. We have now visited 27 throughout Spain. 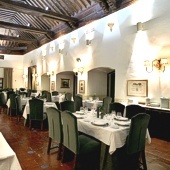 Parador de Oropesa is a luxury hotel in a fourteenth century castle which was later converted into a palace.